Image resolution must be at least 350 DPI. Artwork submitted in Microsoft Office (Word, Excel and Powerpoint) or other format requires conversion to Illustrator format. Additional charges may apply for format conversion. We strive to print colors exactly as they appear in the supplied artwork. To avoid errors in the finished product, we strongly recommend supplying artwork files in CMYK color mode. Additional charges may apply for artwork using PMS / Pantone colors. We recommend image resolution be at 350 DPI or higher. Images created for websites generally have a resolution of 72 DPI (Dots Per Inch). This is much lower than what is required for good print quality. If the artwork is supplied at a low resolution, the printed image may appear blurred, jagged and rough. Printing material requires a minimum of 350 DPI, so please ensure your artwork meets this requirement. Keep in mind higher resolution images generally result in larger file sizes. With access to thousands of fonts available on the internet for both Mac and PC, we cannot guarantee that the fonts used in your artwork are available on our system. This applies to AI, EPS, and PSD files only. Your artwork is checked before we print but missing fonts can cause errors in the artwork and delay the printing process. 1. In your Illustrator Window, click on the text block you want to outline. (Ensure you use the Direct Selection tool in your Tool Panel, it is the Black Arrow in the top most corner, or you simply Press (V)). Or you could simply use a shortcut once the text block is selected, just press Shift+Ctrl+O or Shift+Command+O for Mac. You can also email us a list of fonts used in your artwork and we will be glad to search for them online. For fast printing of your artwork, we recommend sending us the fonts used via email. To do this, simply Open Control Panel, Click on the Fonts Folder, Copy the fonts used in your artwork, Paste to a folder of your choice and attach them in and email to us. Control Panel > Fonts > Copy Used Fonts > Paste (to your folder) > Attach to your email. Artwork should be kept a distance of 4 mm (safety) from the dieline of the sticker. A bleed margin of 4 mm should also be allowed for. The images above illustrate the recommended safety and bleed margins for different sticker types. In assessing the cut of your custom designs, we normally discourage sharp edge cutting as this is prone to cutting errors. To protect your artwork from any imperfections we recommend rounded corners for your custom cuts. We recommend omitting borders from your artwork due to slight movements in the image during the normal printing and cutting processes. Please see the examples below. The slight image shift and cutting error is visible because of the presence of the black border around the logo mark. With this setup, it's almost impossible to notice the effect of the cutting error since attention is drawn to the logo at the center of the sticker and not to the imperfect cuts on either side. Seeing the big picture now? That's why we advise against including big borders in your artwork. You can choose to delete them from your final artwork or we can do it for you. If separate images are included as links, please be sure to embed them in your document. If you are using effects such as transparencies, shadows, blurs etc., these may appear on your screen but may not be part of the printed image. These effects need to be rasterised to ensure they are included on the final print. Please ensure your text size is not too small. Also make sure that the thicknesses of your stroke are at least 0.25 pt or bigger to be visible. 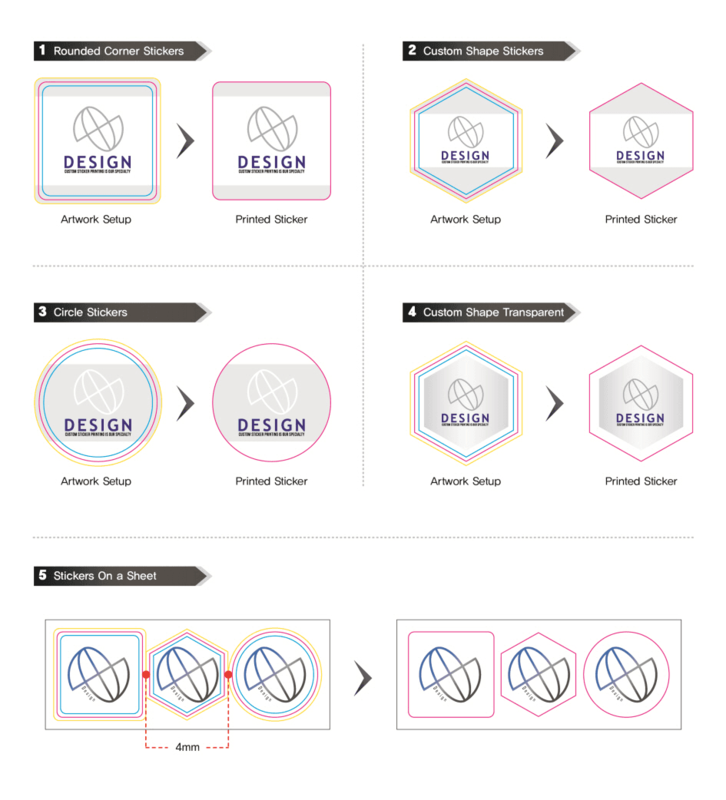 Any thin lines or design elements may not appear on the printed stickers. Copyright © 2006-2019 AllStickerPrinting. All Rights Reserved.